The TAMS 63488 USB/GPIB Controller adds IEEE-488 (General Purpose Instrument Bus - GPIB) capabilities to any computer with a USB port running Windows 2000 and above. The TAMS USB/GPIB Controller takes full advantage of the High Speed USB 2.0 bus performance and delivers the highest possible level of throughput. Whether you are using Agilent VEE, HTBasic, BASIC for Windows, or programming in C with the SICL or VISA library, your code will now run at full performance. The small size and light weight of the 63488 make it ideal for portable applications using a laptop computer, or for sharing the GPIB interface between computers. The TAMS 63488 comes with the SICL (Standard Instrument Control Libraries) and VISA (Virtual Instrument Software Architecture) software. This software offers ease of use and compatibility among different instrument and software vendors. GPIB emulation assures that your existing GPIB programs work immediately, without modification. Since the TAMS 63488 is a standard Plug and Play device, it is automatically detected and configured when connected to the computer USB port. 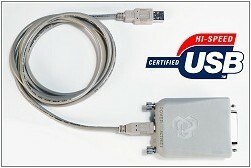 The USB/GPIB Interface software allows transparent communication between a PC and up to 14 GPIB instruments, offering transfer rates over 990 Kbytes/sec for large blocks of data. Compatible with Agilent VEE, C/C++, Visual Basic, LabWindows* etc. Agilent SICL library (version M.01.01 and above) is required. This library is not included with the product and must be ordered separately if needed. HTBasic users can find this library on older HTBasic installation CDs up to version 9.3. * Under LabView and LabWindows only the VISA software API is supported, the native NI-488.2 software interface is not supported by the TAMS 63488.